Two Democratic senators think so. How sound is their case? U.S. National Security Adviser Michael Flynn walks along the West Wing colonnade at the White House in Washington on Feb. 10. There’s every reason to believe Flynn continues to be a key figure—and perhaps the key figure—in Robert Mueller’s investigation of Russia’s election meddling, the Trump campaign’s potential collusion in such, and other crimes that may have stemmed from those affairs. On Monday, two members of the Senate Judiciary Committee posited that Flynn was already cooperating with Mueller, potentially offering testimony that could incriminate Trump. What exactly are the arguments that Flynn is cooperating, how sound are they, and what would it mean if Flynn did in fact decide to roll over? Whitehouse, a former U.S. attorney and state attorney general, laid out his case in great detail on Monday night. (Blumenthal, who also served as a U.S. attorney and state attorney general, was more succinct in his analysis.) Here is a point-by-point assessment of Whitehouse’s theory, one that criminal justice experts have told me is clearly speculative but also makes a great deal of sense. Flynn was caught red-handed and faces stiff jail time. He has pretty clearly lied to the FBI, lied to intelligence agencies on his disclosure form, the defense intelligence agency perhaps, and committed other serious falsehoods that put him in serious legal jeopardy. And as you may know, the penalty for violating the law prohibiting these false statements, which is 18 United States Code, 1001, is five years in prison for each violation. If and when Mueller believes Flynn has something to offer that would be worth either immunity or a plea deal, the lieutenant general would have to answer a series of questions to reach what lawyers call a “Queen for a Day” proffer agreement. That deal is named after a game show in which housewives would tell sob stories in exchange for prizes. “Criminal lawyers generally have a very dark sense of humor,” O’Sullivan said. Flynn is behaving like cooperating witnesses behave. Whitehouse told Blitzer that after Flynn was found to have failed to disclose work he did for Turkey on government documents, he went back and corrected this error. The senator says this is what a cooperating witness would be asked to do. “Comey reported that one of the things the FBI does with cooperators is to get them to go back and clean up areas of noncompliance,” Whitehouse told Blitzer. Various subpoenas indicate Flynn might be cooperating. It’s been reported by CNN, Reuters, and the New York Times that business associates of Flynn received subpoenas demanding “records, research, contracts, bank records, communications” connected to Flynn and his Flynn Intel Group. These subpoenas were sent out by Dana J. Boente, the U.S. attorney for the Eastern District of Virginia, and indicated that this information should be sent to Brandon Van Grack, the investigator reportedly heading the grand jury inquiry into Flynn. Some of these subpoenas were issued in the weeks just before Trump fired Comey. We reached out to Whitehouse’s office to ask what exactly the senator was suggesting here, but no one would speak on the record. Published reports regarding the Eastern District of Virginia subpoenas have not indicated whether Flynn himself has been subpoenaed. 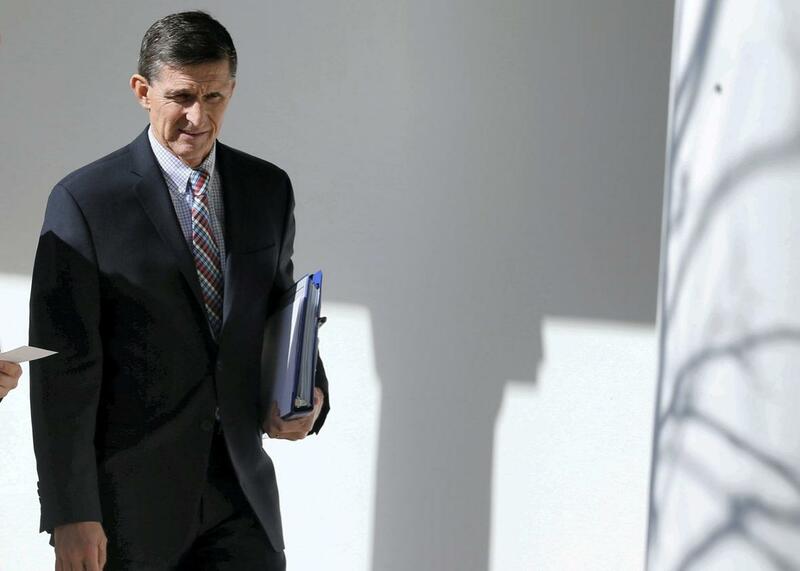 “The government’s never going to tell you what the grand jury has subpoenaed, and if [Flynn] doesn’t say what he’s produced or whether he’s gotten a subpoena you wouldn’t know,” O’Sullivan said. Based on what we know now, it’s impossible to classify this prong of Whitehouse’s theory as anything but speculation. Michael Flynn hasn’t been running his mouth. “One of the more talkative people in Trumpland has gone absolutely dead silent, and that’s what prosecutors strongly encourage cooperating witnesses to do,” Whitehouse told Blitzer. One final argument for why Flynn might be talking, which Whitehouse only hinted at, is that all of Trump’s alleged efforts to block the investigation indicate the former national security adviser might have an incriminating story to tell. O’Sullivan sees better evidence for this theory in the other obstruction element the special counsel is reportedly investigating: Trump’s treatment of Comey. She says Trump’s request to clear the room before he allegedly asked Comey to drop the Flynn investigation is “really hard to explain away” if the president doesn’t have something to hide. The implication for O’Sullivan, then, is that Trump would only do something so “extraordinary” if he had something to gain from it—that is, halting an investigation that might reveal information he doesn’t want revealed. If Flynn has that kind of information, he’d likely have a strong incentive to offer it up as an inducement to decrease his own possible prison term. Ultimately, this is all speculation: We don’t know if Flynn is cooperating yet, and we likely won’t know for a while. That said, Reuters reported on Monday that Mueller has brought on a veteran federal prosecutor, Andrew Weissmann, who helped bring down both Enron and mob boss Vincent “the Chin” Gigante. Weissmann’s specialty in those investigations? Flipping witnesses.